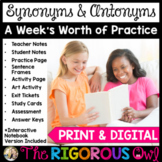 1 Synonym and 1 Antonym lesson plan. 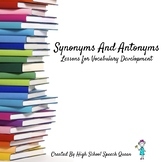 Includes 1 workheet with 10 questions for basic synonyms and antonyms (circle the synonym and underline the antonym for each). 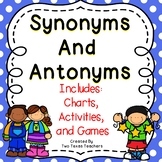 This is a full lesson plan that I used in a third grade classroom. 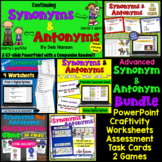 It includes the written lesson plan, antonym and synonym cue card, T-Chart, exit slip, an assessment rubric, and the PowerPoint slides used in the lesson. 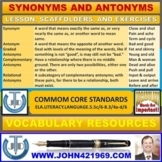 Reinforce the importance of word choice with this lesson on synonyms and antonyms. 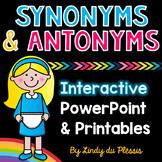 Able to use this lesson with multiple types of text. 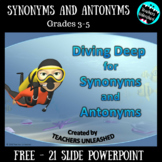 A great weekly lesson plan for teaching synonyms and antonyms. 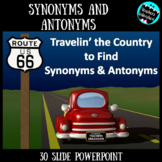 Travelin' the Country to Find Synonyms and Antonyms Hop in the car and travel with us across the United States in search of SYNONYMS and ANTONYMS. 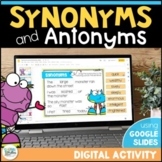 The enchanting animations and theme of this PowerPoint with embrace your students attention as they master this standard and expand their vocabulary. 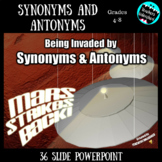 Being Invaded by Synonyms and Antonyms - PPTX and Test Prep This 36 slide PowerPoint will take your students to Mars to try and eliminate the alien invaders attacking your allies. 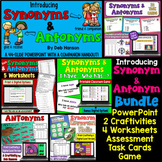 With help from Glook, your friendly neighborhood Martian, your students will learn and practice Synonyms and Antonyms. 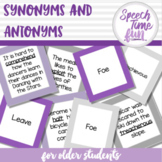 A simple worksheet that introduces synonyms, antonyms, and homonyms and has independent practice for students in choosing from a word bank the synonyms, antonyms, and homonyms for a number of given words. 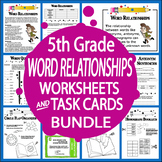 Ideal for grades 5-8.